Singapore-based Tum Create brought its EVA prototype to the ongoing 2013 Tokyo Motor Show. 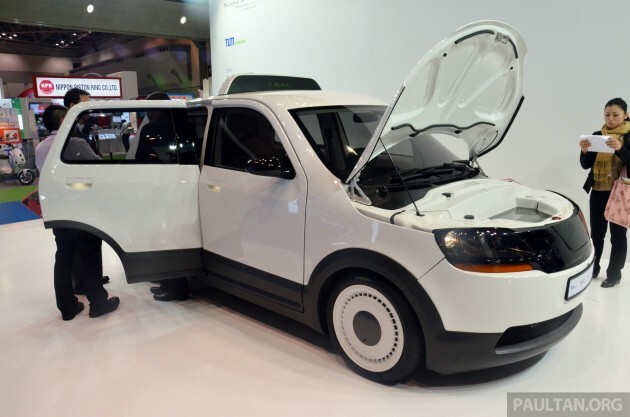 Explicitly designed as an electric taxi for “tropical megacities”, the Tum Create EVA’s party piece is its battery pack, which can be recharged in 15 minutes to yield a realistic 200 km operating range. This, however, is based on Singaporean daily driving patterns and without turning the air-con off. Base it on US FTP 72 standards and the range climbs to an impressive 330 km. Tum Create says the challenges surrounding fast charging include the high electric currents needed, plus the resultant heat generated in the battery pack during charging. To that end, its engineers have designed an innovative concept for better thermal management of the battery cells which aims to extend the pack’s lifespan. The five-door, four-seater’s monocoque structure is composed entirely of CFRP (carbon fibre-reinforced polymer), allowing it to weigh a claimed 1,500 kg. It is 4,316 mm long, 1,794 mm wide and 1,679 mm tall (excluding taxi signage), and sits on a 2,602-mm wheelbase. Its 60 kW/223 Nm electric motor is fed by a 50 kWh 216-cell lithium polymer battery (cell capacity 63 Ah, max voltage 450 V, max current 360 A). Drive goes to the front wheels via a single-speed synchronous transmission. With a 0.34 drag coefficient, the Tum Create EVA hits 100 km/h in 10 seconds before topping out 11 km/h after that. And it’s not just about the powertrain – the taxi has a nine-month to three-year-old child seat integrated in the back of the front seat, an infotainment system that allows passengers to control air-con and audio wirelessly from their personal mobile devices, individualised overhead air-con and seat cooling. Tum Create is a joint electromobility project between Technische Universität München (TUM) and Nanyang Technological University, with support from Singapore’s National Research Foundation. The EVA has been built from the ground up, going from concept to prototype in just two years. ..Private sector sleep and hoping gov doing the R&D..
malaysia – hv been producing car more than 30 years. i guess this is the difference between a country that truly appreciates and attract REAL TALENTS, and a country that says it appreciate talents but does the other way round.. This bcoz our local company is cheapskate! Gov oni can attract them to come n work in boleh..but work where? suppose local company take them n give them appropriate salary n give them R&D jobs…company here r really low tech that y many talented don want to work here…who here work in R&D field does ur salary equivalent to ur counterpart in other advan country? Is this gov fault that u get low salary? First, It’s the government policies that attract and promote good companies, and, which in turn, attract and create the best talents. U guys bash all that rite corrupt la, waste tax payer money la, keloni la, altan**** la, um** la, naj** la, bu** la, 40k bangla la etc…MSC n those 5 coridor is to promote best company to come here..u said it rite when best company are here talent will come here…. Bravo!! I m so proud of their achievement!! awesome research! Singapore 1st car is already advance than us, what make us worse than Singaporean? Everything is same except working attitude. Becoz, they have more Passion with their work! here, too embarrass to say, our Proton is so malu. Parasite to gov and rakyat thus they will never make us proud but burden to all of us! it,s a dedicated research work aided by German technology.To work in the real world will have to take some time before deem suitable for production. weeeelllllll, so has proton, its aided by English U too, and “unlimited citizens’ funding”…. Y we need p1 or gov to do R&D? does private sector in boleh is low tech?.. It is because our government has tax us good on automotive – 7 billion a year, that much of money should not go to crony pocket, spend it for RnD on automotive if the government is decent on built up Malaysia Automotive powerhouse. I am sorry … I think most M’sian worked hard enough but our sweat is not appreciated by our GOV. GOV only think how to full their cronies pocket. Suppose u must directed to urself n suppose we all…especially our local private company..talent? If there is little to no R&D y talent people want to come here? Cheap salary..our local private n foreign company does not want to give higher salary to talented people..do you think they want to give higher salary..hell no..does this oso gov fault? Wow, even the japanese aka Toyota cannot do it. Recharge in 15 mins and can travel more than 200 km in single charge. Bravo. Hopefully it is not just a hype up news. well done~~~ keep it up sg. We dont need ev in Malaysia. There still plenty of oil here. Petronas can assure us. Plenty of open roads and highway. What happen when this ev battery runs out in Kuala Pilah, How to recharge? Singapore Transport now obviously indirectly admitting to the mistake of using kimchis as replacement taxis for Cedric and Crown. only took 2 years to turn concept into prototype? Bravo! And I love the out of the box idea of designing a taxi instead of a normal car. Creative! So instead of directly competing in a wide and competetive car business, they propose to challenge in a small and specific market. Someone need to take note from these U students.